Letitia Hargrave nee MacTavish (1813-1854) was the daughter of Sheriff Dugald MacTavish and Letitia Lockhart. In 1840, she married James Hargrave, Chief Trader for the HBC, and left Scotland for York Factory. 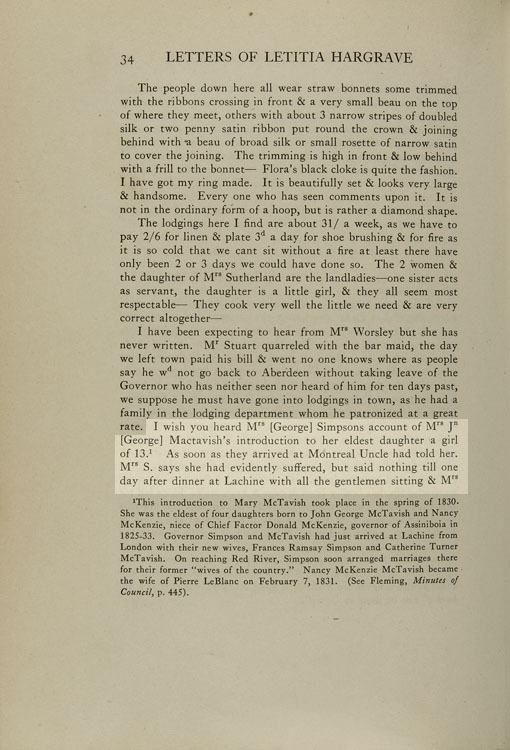 The letters Letitia wrote to family and friends provide us with observations of daily life that differ from the typical post journals of that time which were written by men. Her correspondence is also recognized for its importance as being one of the earliest for pioneer women in the fur trade in Western Canada. Through her letters, we can see her mature from a gawking and sea-sick newcomer to a shrewd and experienced observer of fur trade life. “I wish you had heard Mrs [George} Simpsons account of Mrs John [George] Mactavish’s introduction to her eldest daughter a girl of 13. As soon as they arrived at Montreal Uncle had told her. Mrs S. says she had evidently suffered, but said nothing till one day after dinner at Lachine with all the gentlemen sitting and Mrs Simpson and herself the only ladies. Mr Tom Taylor (brother to the late Mrs Mary Stuart) who was then the Governors servant threw open the door with a flourish and announced “Miss Mactavish”. Uncle rose and took her up to his wife, who got stupid but shook hands with the Miss who was very pretty and mighty impudent. Her father then proceeded to caress and make of her. Mrs M. got white and red and at last rose and left the room, all the party looking very uncomfortable except Uncle and the girl. Mrs S. followed and found her in a violent fit of crying, she said she knew the child was to have been home that night but thought she would have been spared such a public introduction. Read excerpts from Letitia's letters - enter 'Letitia' in the search box to your left. What does Letitia Hargrave look like? Check the Beaver Index - e.g., type in women, children, health, etc.